Founded in 2009 in Amsterdam by brothers Taco and Ties Carlier, VANMOOF has only ever had one aim – to create the world’s best commuter bikes and take them to the people. The brothers have re-imagined how a bike should work in the cities of tomorrow by stripping out unnecessary parts, improving the essentials, and integrated technology to stick it to bike thieves and weather gods alike. With the robust, minimalistic, aluminum bikes, the brand breaks new ground in disruptive commuting worldwide. The ‘Electrified’, VANMOOF’s electric bike, was the world’s first bike which can be turned on/off with a remote control. And if your bike gets stolen, you can immediately trace it due to the integrated GPS-tracking; so far there is a 100% success rate of finding back stolen bikes. VANMOOF has gained international plaudits for innovative and functional design, among them the EUROBIKE award, the Dutch Design Award, RED DOT design award and the Fast Company Innovation by Design award. And the brand has a habit of forging partnerships with the best global technology leaders, including ABUS, Google, Philips, and Vodafone. VANMOOF riders can be found in cities all over the world, and the brand has an ever growing network of Brandstores; currently Brooklyn, Berlin, Amsterdam and Taipei. 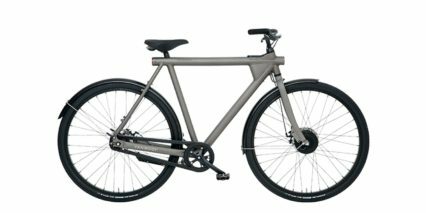 Check out www.vanmoof.com to find out more.